Comment: Study the famous 'Ideal Cut' in person: it makes for a fiery show in every light. In diamond, as in sphene, demantoid and some other rare gems, the dispersion is so high that its splits light into the visible rainbow spectrum, best seen in the side-images. Also the color is observed best from the side, because in the front-images the camera is overwhelmed by the light reflection. The official name in diamond-speak is light 'fancy brown' or 'champagne', darker would be 'cognac' and then 'chocolate'. All these color categories have been gaining attention and value in recent years. 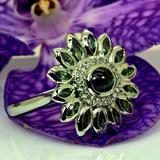 Perfectly cut, with blazing luster, bright toned, this 40-pointer will honor every e-ring with an eye-catching center-gem. Perhaps a different colored variety of smaller gems, say green or yellow, to form a halo, or if you have the patience to let us collect a set of identical smaller diamonds, we could produce a crown of champagne-colored fire. Like all our gems, this diamond comes with full paper-work, free shipping, original AIG report, a 1000sqm of rainforest preserved at WLT in your name, support for the NHRP, and other WildFish perks. 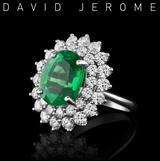 Currently perhaps the best value in colored diamonds, with green or pink, let alone blue, reaching five digits, the calm character of this hue is powerfully supported by the fire of an ideal cut.